Favorite Fictional Character is a Wednesday event started by Ryan at Wordsmithonia. This is my first time! One of my favorite books of all time is Little Women by Louisa May Alcott. 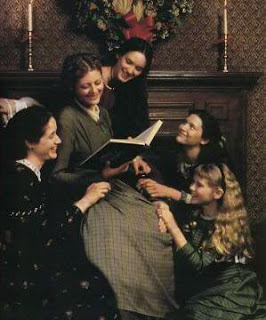 And every year during the holiday season one of the first movies I watch is the 1994 version of Little Women starring Winona Ryder, Susan Sarandon, Claire Danes, Trini Alvarado, Kirsten Dunst, Samantha Mathis, Eric Stoltz, Gabriel Byrne, and Christian Bale (sigh!). Yes, I have already watched it this year...just the other night, in fact! My most favorite character from the book and the movie is Jo March. When I was a girl, Jo was inspiring to me. Her love for the written word and her devotion to writing was partly responsible for sparking the same in me. And I loved her fierce independence and individuality...in that time period, Jo was almost a feminist. She threw convention out the window and marched to her own drummer. But she was very devoted to her family and her sisters meant the world to her...especially dear, sweet Beth. Watching Jo lose Beth is one of the most heartbreaking moments in cinematic (and literary) history. Every time I watch or read this part, I am reduced to tears...every time! Jo, and the story of Little Women, show us that family is the most important thing on this earth. But also the importance of being an individual and following your dreams. And the March family know the true meaning of Christmas...the spirit of love and giving. If you haven't read the book or seen the movie, you should do so immediately! It's a great story any time, but especially at Christmas. I'm so excited you joined in this week. It's very exciting to learn of other bloggers favorite characters. I must admit that this is not one I've seriously visited since high school but I thinkyou may have convinced me to give it another shot. Great post this week and I look forward to many more! Oh Jo, that is a wonderful pick! I loved her character ~ the strength she had to do as she wanted in a time that it was still unseen. I loved her family sense as well. Very strong character if ever one. I was so happy for her when she finally found love too. She deserved it. Excellent choice! I think this was the first book I ever read that actually brought me to tears. Made a big impression on a little girl. Loved your post! 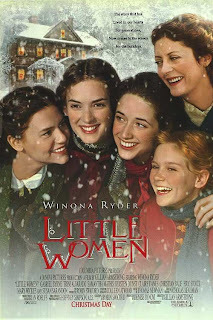 I also loved Little Women, both the book and the older movie ( I don't remember if I saw the new one). I haven't watched the movie in years, mostly because it's too sad when Beth dies. This is also one of my favorites! I loved the movie too! The part with Beth gets me every single time too! This was a favorite book of mine as a young girl. I haven't seen the movie, but now I want to. "Little Women" is one of my all-time favorites, and of course Jo was my favorite character, too! I went on to read more about that character in "Little Men" and "Jo's Boys." I've gotta admit, Jo was my favorite, too. I remember identifying with her soooooo much! While I loved Little Women, I must say there is not character in all of literature who I like as much as Jane Eyre.... great posting idea! Jo is my favorite character as well!! I love how she is independent, yet so loving of her family. My only sadness was that she didn't end up with Laurie . . .